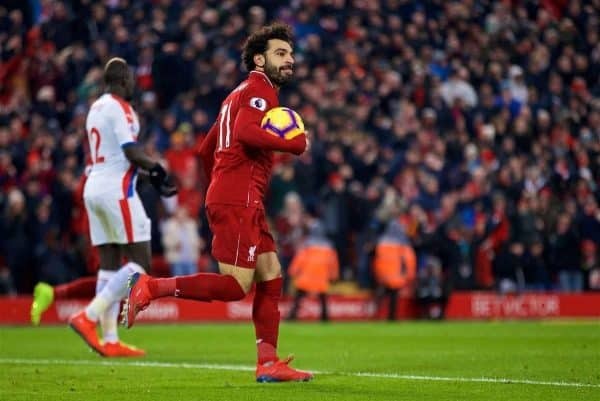 Liverpool endured a tough afternoon at Anfield as Mohamed Salah struck twice to help secure a 4-3 victory over Crystal Palace in the Premier League. Palace arrived at a bitterly cold Anfield looking to add another top-six scalp to their collection after stunning Man City back in December, and were met by a fierce home atmosphere. Jurgen Klopp lined his Liverpool side up in a 4-2-3-1 formation, with three changes from the 1-0 win at Brighton last time out as James Milner started at right-back and Naby Keita took up duties on the left. A win would ensure a seven-point lead over City ahead of their trip to Huddersfield on Sunday, and though it was a frantic afternoon they were able to do so. The game plan looked to be to fire on the 39-year-old, third-choice ‘keeper Julian Speroni’s goal whenever possible, but Palace did well to limit the Reds’ efforts with a rigid defensive approach. Keita, on his first league start since the 2-0 win at Wolves, looked to struggle with both the physicality of the game and his positioning in the first half, as concerns over his form continue. Against the tall, strong Palace defence it was interesting to see the majority of Liverpool’s chances come in the air, with both Joel Matip and Virgil van Dijk coming close with headers from Milner deliveries. 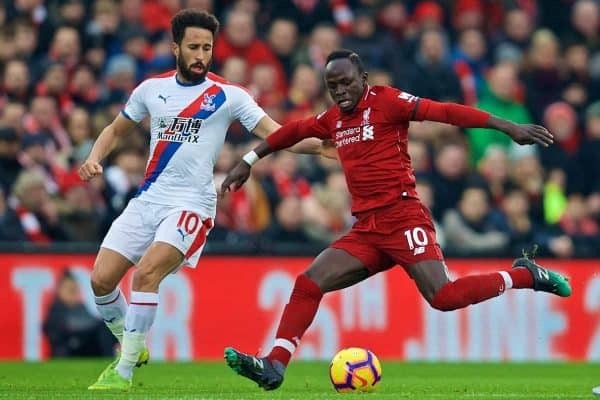 But the problematic matchup of Milner and Wilfried Zaha gave the visitors the opener, as the winger burst past the Reds’ makeshift right-back and clipped the ball in for Andros Townsend to fire past Alisson. A heated first half flared up as Salah fell particularly softly in the penalty area following minimal contact with Mamadou Sakho, and a sour mood pervaded Anfield at the break. Liverpool emerged unchanged for the second 45, and took up an aggressive approach that immediately resulted in an equaliser, with Van Dijk’s deflected long-range effort ultimately turned in by Salah. 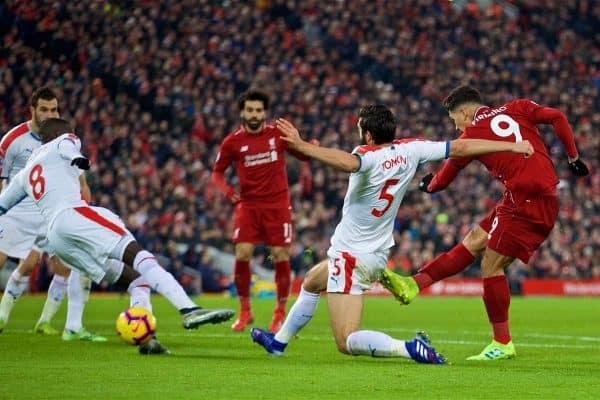 This sparked the crowd back into life, and this ensured the Reds kept up the pressure, and they soon took the lead as Bobby Firmino picked up the ball in the box, turned and fired past Speroni via a Palace defender. After that, the pace dropped, and Palace looked to take advantage through Zaha, who had the beating of Milner almost every time out wide, and their counter-attacking work eventually won the corner that led to James Tomkins’ equaliser. Klopp then changed tack and introduced Xherdan Shaqiri as the ineffective Keita made way, with Anfield hoping for another game-changing display from the bench from their new No. 23. The timely intervention came through a player in another iconic shirt number, however, with Milner’s cross fumbled by Speroni and then turned in by Salah for his 50th goal in the Premier League. A worrying injury for Fabinho saw the Brazilian leave the field in the closing stages, and Milner was sent off for a second yellow card, but a late goal from Sadio Mane guaranteed victory regardless—despite Max Meyer’s late consolation.